The lens of the eye is a small oval structure consisting of a thin, clear capsule enveloping a fluid protein. The protein is clear and colourless at birth, but over the years it discolours and clouds gradually. It first yellows, then turns brown, and finally, cloudy. Often, it is not diagnosed until the fluid becomes so cloudy that it interferes with vision, but, in fact, the process is usually gradual (rapid development may be induced by elevation of blood sugar or use of some drugs). A cataract is not a growth, nor is it a film over the eye. The discolouration and clouding of the lens protein fluid arises from a number of processes. One is cross-linking of the proteins, which converts them to thicker, darker coloured materials. Cross-linking of proteins is caused by exposure to UV light, by oxidative chemical reactions, and by addition of glucose to the proteins (glycosylation) that promotes cross-linking. Therefore, using good quality UV-blocking sunglasses to protect the eyes, having an antioxidant-rich diet (and avoiding smoking, which increases oxidation reactions), taking additional antioxidants, and keeping blood sugar well-regulated can all help slow the development of cataracts. Topical application of antioxidants has been tried in many countries as a means of preventing further development of cataracts and even reversing them; these methods are rarely used in the U.S. in routine ophthalmology care. In addition to protein cross-linking, breakdown of the normal proteins of the lens may also occur, especially if calcium levels in the lens increase (the cause of such change in calcium is not yet established). A calcium-activated protease can break down the proteins into smaller units, rearranging the protein matrix and scattering the incoming light. Enzyme inhibitors are considered potentially useful in preventing and treating cataracts: inhibitors of aldose reductase may slow cataract formation in diabetics by preventing glycosylation of the proteins and protease inhibitors may prevent the breakdown of the lens protein. Such inhibitors have been derived from herbs and developed as new drugs. As examples of herbs of potential use, salvia and licorice are potent inhibitors of aldose reductase; the flavonoids from pueraria and scute also serve this function. It is difficult to reverse the clouding of the lens that has already occurred, but there may be mechanisms within the lens that help restore the protein fluid so that if the destructive processes cease, some degree of improvement may occur. Efforts should be made to begin prevention measures early: as soon as cataracts can be detected (during routine eye exams) and even sooner where risk factors can be identified (high exposure to UV light; diabetes). The previously-mentioned preventive practices-sunglasses, good diet, not smoking, taking antioxidants, regulating blood sugar-should be standard for people over the age of 40. Wearing sunglasses to protect the eyes can also slow development of floaters; other therapies, such as relying on antioxidants, may similarly be useful for restraining formation of floaters, which also involve changes in the protein fluid. Pirenoxine eyedrops (a modified phenoxazine carboxylic acid) for cataract; this is labeled Catalin (in Japan); it is also sold as Clarvisan, Clarvisor, and under other names; a Chinese version is called Baineiting. 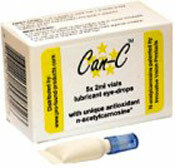 N-acetylcarnosine, is an antioxidant provided as an eye drop; the pictured product is called Can-C; carnosine is also sold as Bright Eyes and NuEyes, and under other names. Carnosine is a dipeptide (alanine-histidine) researched mainly in Russia as a treatment for cataracts. In one study, it was claimed that after 6 months, 89% of all eyes treated with the drops had an improvement of glare sensitivity; 41% had improvement of the transmissivity of the lens, and 90% of the eyes showed improvement in visual acuity. The improvements were said to be retained during two years of follow-up with continued use of the eye drops. Carnosine may specifically inhibit glycosylation of the lens proteins. A Swiss product called Quinax (dihydroazapentacen or azapentacene polysulfonate) is used as a treatment for cataracts. According to one research report from Poland: "An observation of (on average) 5 years duration showed that systematic application of the drug prevents the development of early senile cataract and distinctly slows down the progress of the condition in the group of patients without the risk factors. Non systematic application of the compound also slows down the progress of the condition in the group of early cataract. 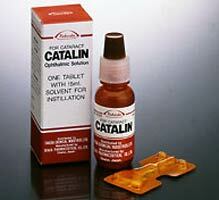 The drug was ineffective in patients with an advanced diabetic cataract."